Microsoft announced that Kids Corner feature will be removed from upcoming Windows 10 Anniversary Update. Dona Sarkar said on Insider Blog that team will not work on this feature anymore because of too low use of this feature to justify continued development and support. 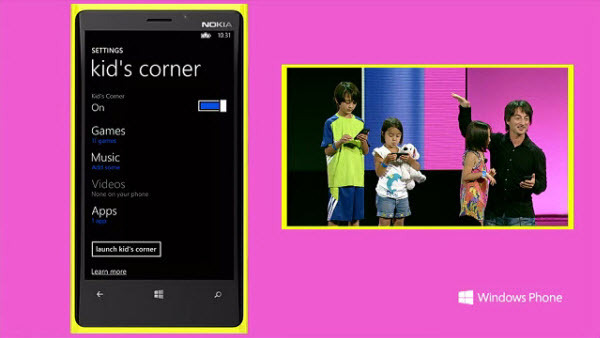 Team suggested that users can try out Apps Corner. Dona Sarkar informed insiders while releasing Windows 10 Insider Preview Build 14367. After taking a look at the overall usage of the Kids Corner feature in Windows 10 Mobile and Windows Phone 8.1, we have decided to remove this feature from Windows 10 Mobile beginning with the Windows 10 Anniversary Update. The usage of feature was too low to justify continued development and support of the feature.